The Lamborghini Miura. There is so much to be said about this car – the way it looks, the way it performs, the legacy. This is the P400 SV model, of which 150 were built. It was the last series of Miuras built from 1971-1972. The 4.0 liter V12 made 380 horsepower in SV form (although Gooding’s website says it makes “85” horsepower, which seems a little low). Performance was astounding for the day and quite capable for the present time. The 0-60 mph time was around 6.5 seconds, which could be bested by a handful of SUVs in today’s world but the top speed of 171 still blows most cars away (if you can keep the front wheels on the ground). The styling, by Bertone, is like nothing else. The SV is differentiated by its lack of “eyelashes” above the front headlights. Other models featured little slits running toward the driver but the SV has a black, flat headlight enclosure. These cars are so low and swoopy that they beg to be driven – and fast. Look at those tires. They look like they came off a GT40 that just pitted at LeMans. SV Miuras tend to be the ones you want. Prices have steadily risen over the years and now you’re going to pay $1,200,000-$1,400,000 if you want one (as this is the estimate for this car). It’s simply Italian brute and beauty combined into one awesome machine. Check out more about this car here and more about Gooding in Scottsdale here. 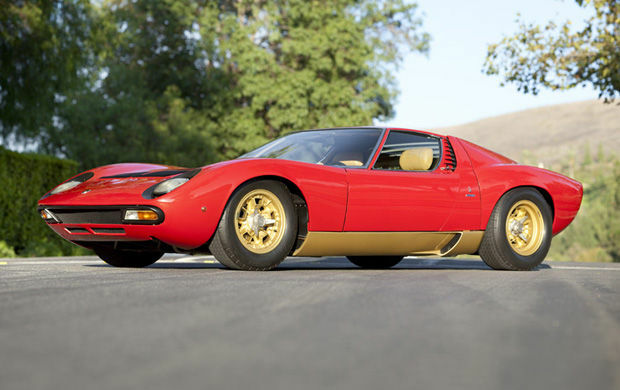 This entry was posted in Uncategorized and tagged 1971, auction, car, classic, classic car, gooding, gooding & co, lamborghini, miura, p400, sportscar, supercar, sv by classiccarweekly. Bookmark the permalink.